Grapevine wreath suspended from a tree, draped with sheer fabric found on clearance and used for previous parties. White sheets make the perfect table cloth - they bleach easily, they are big enough to drape, and my linen closet is full of them! A bit of a splurge- the rose petals. A few dozen roses (if you can get old ones they are discounting you can spend about $20 and really make an impact) deconstructed to decorate the grassy carpets with a bit of color around the table. 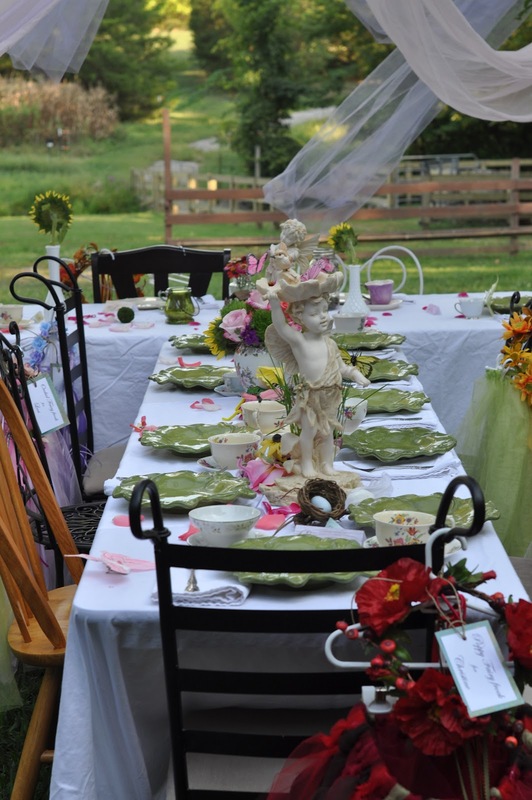 A few folding tables in the yard, along with nearly every chair we own will accommodate 14 guests ranging in age from 2 to 12. ....while smaller fresh blooms burst from tea pots and tea cups. And a sweet friend can always be counted on this time of year to provide an abundance of garden grown zinnias to add extra color and homegrown delight. Small doves and bird nests were scattered along the length of the table, scavenged from the Christmas decorations boxes. .....and c*rning ware dishes and glass jars were planted with moss and ferns dug from the yard and turned into tiny fairy gardens with the addition of furniture items borrowed from the dollhouse. This is the perfect time of year to snag a few fairy statues, when all of the garden decor goes on clearance at your local hobby store. I bought these 8 years ago and they have been used for three different fairy birthdays now, so at $7 each they were a deal! 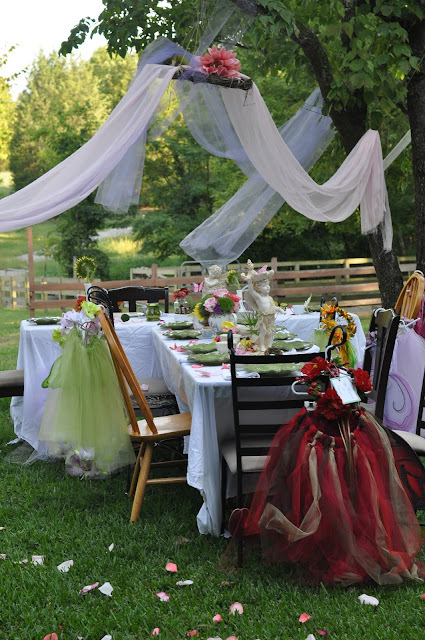 And upon her arrival, each fairy guest found her very own set of fairy attire hanging from her chair. 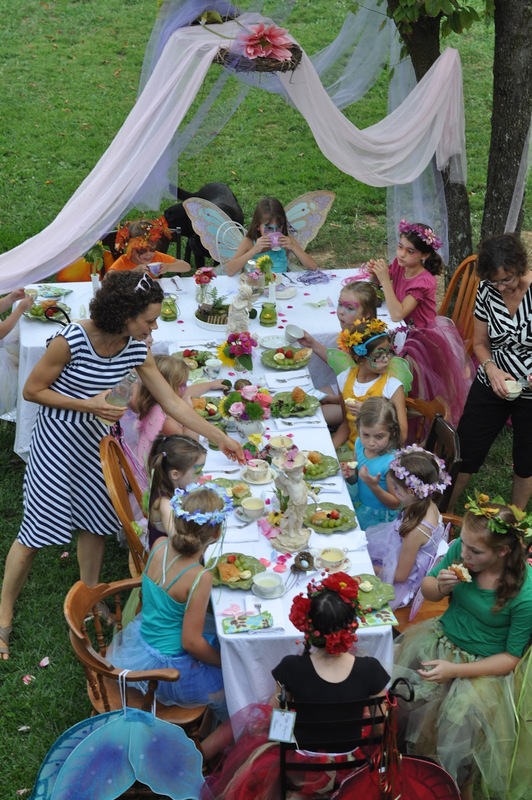 An aerial view of all the little fairies feasting. ......little ones gone, food put away, candles still flickering in the dark. I am sure there were some pixie visitors just waiting for us to all go to bed so they could continue the festivities!